Avengers: Infinity War came out this past weekend. As I’ve mentioned on this blog before, I’m a big comic book fan. I grew up watching the cartoons and reading the comics. 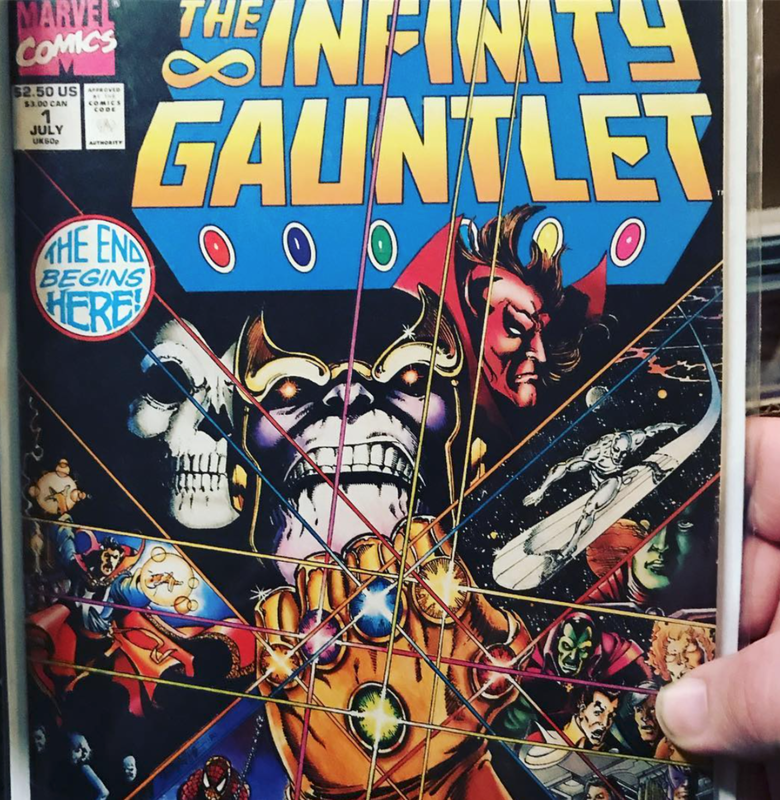 In fact, I even have Infinity Gauntlet #1 from ’91 which the latest Marvel Studios films borrows heavily from its storyline. As a fan, I’ve seen Avengers: Infinity War three times so far and I absolutely love the film. The villain, Thanos (which any Greek reader would be able to surmise comes from the word thanatos meaning death), is one of the more fleshed out villains in this resurgence of comic book based films that millions have been enjoying since Marvel’s Iron Man in 2008. Thanos, like all villains, sees himself as the hero of this story. As Loki said of himself in the original Avengers film, Thanos is “burdened with glorious purpose” or at least he thinks so. Thanos’ plan is an interesting one. As Thanos looks across the galaxy he sees that life is unsustainable. Too many mouths to feed and too few of resources. He wants to “save” the universe by destroying half of all life. This way those who remain will not know hunger, thirst, or devastation, instead he believes they will enjoy a paradise where resources are many and suffering is a thing of the past. We all know Thanos is in the wrong, we all know he’s the villain. Yet, this ideology of his is very similar to what many believe today. The slaughtering of innocents for the sake of abundant resources has been legal in North America for decades. There might not be a 10 foot tall gauntlet-touting Titan involved, but millions of women have used the same ideology as Thanos to justify the murder of unborn children. Abortion continues to be the most devastating “normalized” sin in our culture today. Every day innocent children are sacrificed to the pagan god of comfort. According to research from Guttmacher Institute, all of the top reasons that mothers decide to abort their babies has to do with their own well-being. Either they cannot afford the child, the child will dramatically change their life, or the child will alter their relationships so rather then struggle with those consequences, they murder their children. This act of cruelty is done with the goal of making their life better. If they don’t have this child, then they can pursue their education and better their life. If they don’t have this child, then they can have more money and better their life. If they don’t have this child, then they won’t damage relationships and will better their life. Thanos’ thinking is much the same. If half the universe were gone, then the half that remain would have much better lives. They would have money, food, and even land. This is why the villain hatches his wicked plan, and this is the same reason why millions of babies have been aborted. It’s not life that is important according to this ideology, rather it is the quality of that life that is more important. If a life is void of comfort or has to struggle in some profound way then this ideology would say that it is better for that life to be snuffed out so that another life could be more plentiful. Just as we all know Thanos is in the wrong, there is something deep in our hearts that scream the same about abortion. Abortion is wrong, we see it in Scripture and we know it in our hearts. It’s not right to say that one life is more important than another. Yet, this is exactly what is communicated when a child is aborted. This ideology states that the life of the mother deserves to have a better life at the cost of the baby’s life. It’s a terrible trade that can only be described with one word - murder. In contrast with Thanos’ ideology, there is an opposing view from Captain America in the film. At various points in Infinity War, there are moments where it would be far easier to sacrifice one of the Avengers so that they can all live. Yet, Captain Rogers bravely states, “We don’t trade lives.” This simple statement communicates that life is always important and is not to be thrown away for the comfort of others. These two comic book characters, Thanos and Captain America, have directly opposed ideas about life and so should the Christian in the face of what we see in culture. 1. Guttmacher Institute, Reasons U.S. Women Have Abortions.